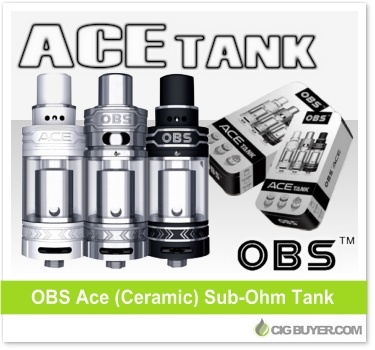 Like it’s popular sibling, the OBS Crius Tank, the OBS Ace Tank has a ton of user-friendly features such as an easy to use side-filling port and juice flow control, but the Ace Tank incorporates OBS’s new Ceramic Core heating element for improved flavor production and longevity. It includes dual adjustable airflow in both the base and top cap, with a generous 4.5ml of e-juice capacity. The ceramic coil heads are available at 0.6 and 0.85 ohms, and a rebuildable RBA deck is also available for creating your own custom builds.